Promoting remyelination following injury to the central nervous system (CNS) promises to be an effective neuroprotective strategy to limit the loss of surviving axons and prevent disability. Studies confirm that multiple sclerosis (MS) and spinal cord injury lesions contain myelinating cells and their progenitors. Recruiting these endogenous cells to remyelinate may be of therapeutic value. This review addresses the use of antibodies reactive to CNS antigens to promote remyelination. Antibody-induced remyelination in a virus-mediated model of chronic spinal cord injury was initially observed in response to treatment with CNS reactive antisera. Monoclonal mouse and human IgMs, which bind to the surface of oligodendrocytes and myelin, were later identified that were functionally equivalent to antisera. A recombinant form of a human remyelination-promoting IgM (rHIgM22) targets areas of CNS injury and promotes maximal remyelination within 5 weeks after a single low dose (25 μg/kg). The IgM isoform of this reparative antibody is required for in vivo function. We hypothesize that the IgM clusters membrane domains and associated signaling molecules on the surface of target cells. Current therapies for MS are designed to modulate inflammation. 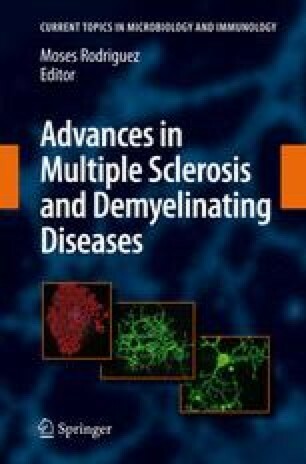 In contrast, remyelination promoting IgMs are the first potential therapeutic molecules designed to induce tissue repair by acting within the CNS at sites of damage on the cells responsible for myelin synthesis.